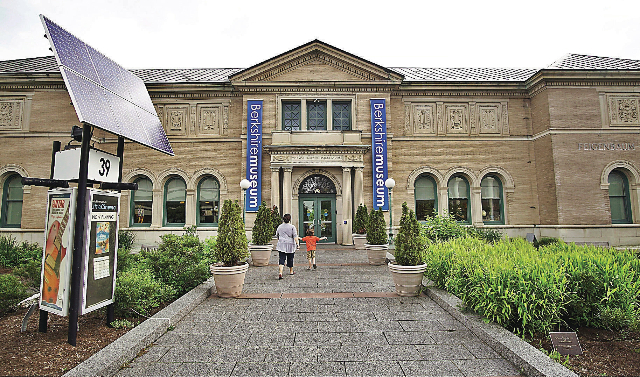 Last summer the Berkshire Museum sucker punched the community with a preemptive, shock and awe assault on its 114-year-old heritage and legacy. We are inching ever closer to the November auction at Sotheby’s when beloved icons including two works by Norman Rockwell, several rare Hudson River School paintings, two early works by Alexander Calder and a mix of 40 treasures will be going, going, gone. That entailed selling its most renowned treasures, gutting the museum of its auditorium with two Calder sculptures, and trashing the historic Crane room which includes site specific, decorative sculptures by Calder’s father. Alexander Milne Calder created the colossal, bronze, standing sculpture of William Penn on top of the dome of City Hall in Philadelphia. Dismayed by a cheerleading Berkshire Eagle editorial I was the first to write a letter to the editor critical of the sale as it violated museum ethics which I spelled out in detail. It was posted to the Friday website prior to running in the Sunday paper. Emerging from a theatre matinee that Saturday, I was dismayed when an Eagle editor e mailed me that the letter had been taken down. That resulted from of an effort to suppress by the museum. The note invited me to resubmit. I did and it was posted. That initiated a pattern of interference and obfuscation on the part of the museum. What started as vox clamantis in deserto has gathered volume as a mighty roar. With the Eagle fully committed to coverage, airing all sides of the controversy, it quickly escalated from a local issue to national and global news. Currently, there appears to be fatalism and resignation that nothing is capable of aborting the sale. The intensity of coverage of a lost cause has died down. This week, however, The New Yorker, weighed in with coverage by reporter Felix Salmon. The well crafted think piece conflates published sources but with unique emphasis. To the Eagle and other media the museum has offered disinformation crafted by pricey PR consultants and denied access to Shields, McGraw, board members and staff. Now add The New Yorker to venerable media outlets the museum has snubbed. While denying requests for interviews the museum has issued statements, press releases and bought ads in the Eagle. That strategy indicates a massive cover-up. Instead of being eager to share good news there is a bunker mentality. The norm is to come clean unless you have something to hide. That’s a devastating statement coming from a fake news publication renowned for the highest professional and ethical standards. While the piece appears with the byline of Salmon it is the norm that it has been fact checked and polished by a team of editors. In so doing not only is the museum violating the trust of all those who donated 40,000 objects to the museum but it is putting at risk all objects in all museums. It has been reported that from day one Shields looked at the Rockwells and saw a pot of gold. Monetize, monetize, don’t let treasures evade your eyes. Not if, but when, Van and Buzz demolish and relaunch the museum it may take all the king’s horses and all the king’s men to put their shattered reputation together again. They have transformed a beloved regional museum into a pariah. They are counting on the unwavering support of business leaders, politicians, parents and kids to embrace its vulgarian New Vision. Instead of being embarrassed when his past was revealed it made him an attractive candidate to at least some factions of the board. It has been suggested that the search committee failed thoroughly to vet the candidate. Sources, however, indicate knowing exactly what they were getting. The unique aspect of the New Yorker piece is the depth of its probing into the transition from ousting former director, Stuart Chase, to hiring Shields. When the story broke I sent Chase a list of ten questions. By e mail he respectfully declined to comment. Until now there has been no coverage of his view of the current deaccessioning. Salmon’s report has four paragraphs on Chase. There are no direct quotes. The information, however, feels intimate and close to the source. Either the reporter managed to speak to Chase off the record or he interviewed individuals who worked closely with him. While more adept at dividing communities than bringing them together for many, including those in high places, Van’s the man. He could not be more different from Chase who “… is well remembered in the Berkshires: during his tenure as director, he raised ten million dollars in a successful capital campaign. Thanks to accounting rules, however, Chase’s ten million dollars in capital improvements, for all that they were paid for in full by donations, created an annual non-cash “depreciation” expense, most recently five hundred thousand dollars, on the museum’s income statement. In turn, that non-cash expense is being used to justify the need for the increased endowment." Chase led a capital campaign for $10 million. Another $7 million came from the deaccession of three early modern Russian paintings which had never been displayed. The expenditure of deaccesion funds complied with museum ethics. He raised a total of $17 million. It is interesting that when a museum director insisted on professional standards this is reported as “tension” which “disappeared” when he left. In Shields the board found a director eager to play along. Or, so it would seem. When the board voted on the deaccessions last July it was reported that two members abstained. At least one of them has now resigned. As the Eagle reported “Carol Riordan, who said she abstained from the July 12 vote to auction off art as a means to fund the museum’s New Vision, resigned because she disagreed with the plan. For now it appears that all is lost. It is a time for those who treasured the museum for all of its quirky, eccentric charm to sit shiva. A day of reckoning, however, is inevitable. When Van and his fans cut the ribbon for the New Vision there will be the challenge of winning back the hearts and minds of many of the good people of the Berkshires. There’s no way to put a price on how much that’s worth. In a followup article for the the site Cause & Effect Salmon offered addittional insights of the extent to which Shields and the museum as a matter of policy have stonewalled not just the media but the Mass Cultural Council. "...he strung Parnass (Eagle reporter covering his prior misadventures in South Carolina) along for weeks, ultimately never granting a long-promised interview. "That kind of arrogance is entirely in character, for Shields: the most telling part of this entire story, for me, was when the executive director of the Massachusetts Cultural Council, Anita Walker, told WBUR that she had been calling the museum every day, and that they had steadfastly refused to engage with her. The MCC not only represents the state of Massachusetts; it is also one of the museum’s biggest donors, having given some $1.2 million over the past 10 years. Shields won’t talk to them, and he won’t engage with the regional newspaper, and he won’t talk to me, and he generally shows no indication whatsoever that he feels in any way accountable to the community which his museum exists to serve. "Amazingly, Shields is being encouraged in this stonewalling by the board president, Buzz McGraw; by the museum’s lawyer, Mark Gold; and even by the PR professional brought in to crisis-manage the situation, Carol Bosco Baumann. (To give you a flavor of how Baumann works, after telling me that she would be “happy to help” me with my request for an interview, she then immediately turned around and tried to persuade The New Yorker to take me off the story. Naturally, the interview never materialized.)" "to the Trustees and the Director: DO THE RIGHT THING; withdraw the paintings from Sotheby's Auction in November; it's not too late to reverse your decision." "Not over till it's over. But why so many people in this area don't care when they are being lied to is beyond me."